I've never been to New Orleans, and now I want to. This story invites me to see the history of Congo Square, and celebrate those slaves and non-slaves, after six days of hard work, who met and made music, met and danced, met and helped each other prepare for the next hard week. Congo Square is located in Louis Armstrong Park, is now on the National Register of Historic Places and according to the foreword by Freddi Williams Evans, a Congo Square expert, we are all invited! The story told about this important place shares that in Louisiana, it was the law that everyone, including slaves, had to rest on Sunday. Weatherford tells the tale in couplets, and page by beautiful page, we see slaves working hard, making it through all their tasks, making it one day closer to Sunday, and Congo Square. For example: "Wednesdays, there were beds to make,/silver to shine, and bread to bake." There, among the dancing and music making, they also met those from the countries where they were captured. They spoke their original languages, and learned what was going on in the community from each other. It was a unique place because in other places, slaves were not allowed to play African music or speak in their native languages. Here they could, and did. I loved R. Gregory Christie's art in The Book Itch, and love the art in this one two. It's hard for me to describe how he did the pages. 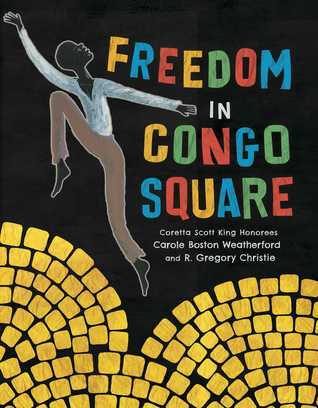 It seems to be in a folk-art style, but what strikes me most is that each page shows such motion, and especially when you get to the Congo Square pages, the dancing and the music. Each day leading up to Sunday there is action, work, work, and more work. On Sunday, there is still movement, but the dancers fly and the musicians show feeling in their bodies as they play. The end papers appear to be of African design. Carole Boston Weatherford writes a nice author's note at the back and adds a glossary. Did you know R. Gregory Christie owns a children's bookstore? Its name is Gas-Arts gifts and you can find the web page here. It's a book to remember! And here is a book perfectly timed for this election year, about two fighters for equal rights. Susan B. Anthony and Frederick Douglass became friends in Rochester, New York where there is a statue showing them having tea together. The story imagines what it might have been like when they met, but it also shares a little of each of their childhoods. Susan loved to learn, but was denied that right because she was a woman. Frederick was born a slave, and escaped to the north, learning to read and then wonder why he couldn't do what others did. As Anthony and Douglas grew to adulthood, both continued to question the denial of their rights, to vote, to do all the things that white men could. They never stopped fighting for those rights. The illustrations are realistic with bold color, with some background parts showing swirls of words surrounding these two famous people. There are parts of the Constitution, parts of the speeches and articles each wrote. There is an author's note and a bibliography at the back. The book can start many conversations about Anthony and Douglas, what they did, how they fought for the rights we all now have. I liked Two Friends, I read it over the weekend. At first I was a little underwhelmed, I wanted more to the story. But then I realized it really is supposed to be about a moment in time. There is spare text, I agree, and I imagine I would use it as a start to something more, Michele, depending on age. I did love hearing about the statue. I have been to New Orleans many times but never to Congo Square. If you come to NOLA, let me know. 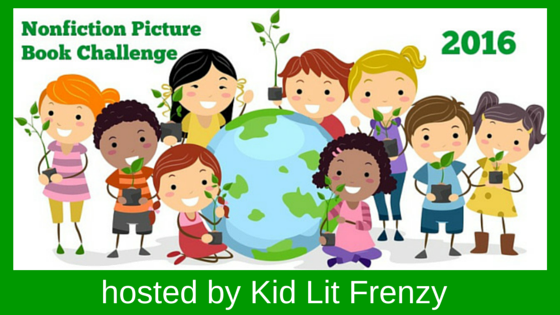 I'd love to meet you and show you some favorite sites. Wouldn't that be a marvelous trip, with you my expert showing me New Orleans. Thanks, Margaret. I love your observation that Christie's art shows motion. I'm still waiting for the book, but I see what you mean on the cover. Can't wait to see the rest of the art! I enjoyed the spare story, but the art enhanced it immensely, Annette. Hope you enjoy it. 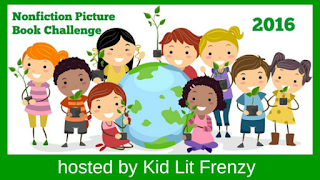 Hi Linda, I just happened upon The Book Itch at my library and would like to read Freedom in Congo Square. I enjoyed Two Friends also. I loved learning about The Book Itch, great story, glad you liked it, too, Gigi. And now Freedom In Congo Square is another one! Wonderful, Crystal, I'll look it up! Thank you! I want to read both of these! 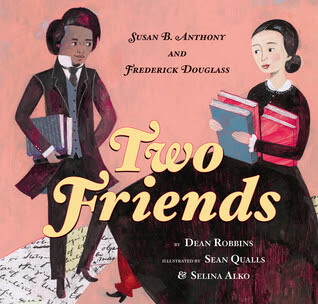 I love learning about Frederick Douglass, and I didn't know about his friendship with Susan B. Anthony. I didn't know about the friendship either, Kellee. Enjoy when you get them! I wrote about Freedom in Congo Square last week so I am well aware of the beauty of this book Linda. I have the other book on order and now I can't wait to read it. I remember that you shared last week, Margie. I'm glad that I had the book from the library after reading your review. Enjoy Two Friends! The more I read about Frederick Douglass the more in awe I am! I need to get that other book, Earl. Hopefully I can find it soon!